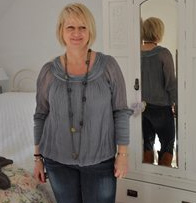 So why do I call choosing the right clothes the 'Clothes Diet'? Because that's exactly what it is! 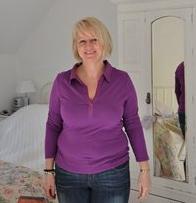 In my 30 years' experience I have found that so many of my clients look slimmer with their clothes off than they did in the clothes they were wearing when I first met them! We are all aware of fattening foods that contain more calories and therefore eating them can result in weight gain, but equally we are also aware of foods that contain fewer calories and that these will help you stay slimmer and healthier. Think about this, how is it that some days we feel big in our clothes and some days we feel slimmer, and yet you weigh the same? The only thing that's changed is the clothes you are wearing, hence the power of the 'clothes diet'! The photo on the left shows Alison wearing a top that makes her look bigger, it clings to her lumps and bumps because of the style and fabric. The photo on the right shows Alison wearing a top that makes her look slimmer. So next time you get ready, you need to think am I wearing flattering or unflattering clothes? It is easy to become 'blind' to our own wardrobe, so you need to take a really critical eye and look at yourself as someone else may see you.